This is what it looked like after removing plant matter, but before digging it out. I did end up digging it out a little more than this in some places. I had several things to my advantage when I began the 3 hour project. There were some odd piles of rock around left over from some of my son’s other jobs. I have recently watched my landscape architect son work on a patio in our yard. I began by roughly digging and leveling out the intended patio, or walkway, area. Since I knew I was going to be winging it with materials and the space had some odd angles, I didn’t take a lot of time pre-measuring. When I thought it was about the size I wanted, I went and got a couple of the pavers to see how they fit. I then decided that in order to use them best, I needed to dig it out a bit wider, rather than make the area more narrow. 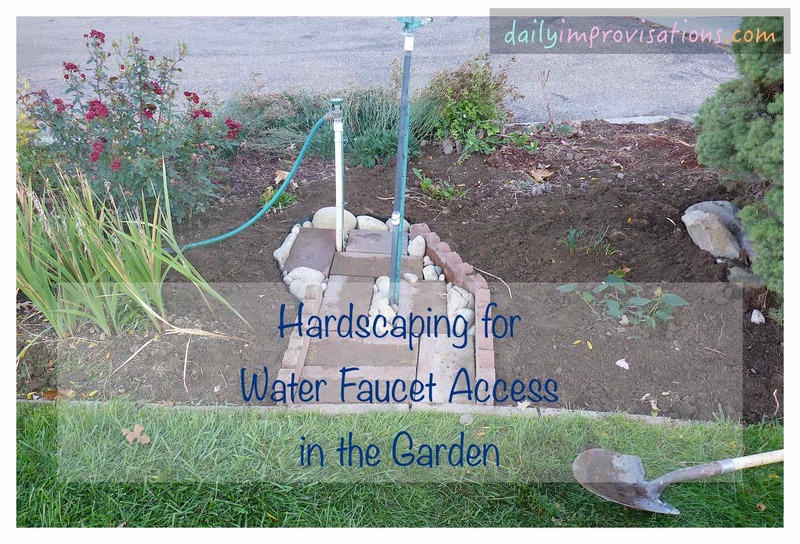 The faucet and sprinkler were not in a straight line perpendicular to the edge of the garden bed, so that meant I needed to accommodate some sort of curve or turn in the patio. I guess this was also because I was not willing to remove all of the plants nearby to make it straight. I went with a subtle angle to one side, knowing this would limit my choices for laying very many pavers tightly together. My next step was to cut some weed barrier fabric approximately the shape of the area. This is a type of fabric-paper that has been used under various brick pathways on our property. It is NOT plastic. Water can get through. I then estimated where to cut holes in the fabric so that I could just slip it over the pipe risers from above. I wanted to avoid multiple pieces of weed barrier fabric or needing to deal with dirt sifting between overlapping layers while I was working with it. Once I placed the weed barrier fabric, I folded in on the one side to make it fit the shape there. 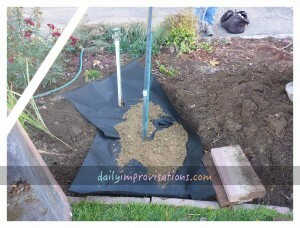 With the black, professional grade weed barrier fabric in place, I have started putting in a layer of sand and gravel mix. 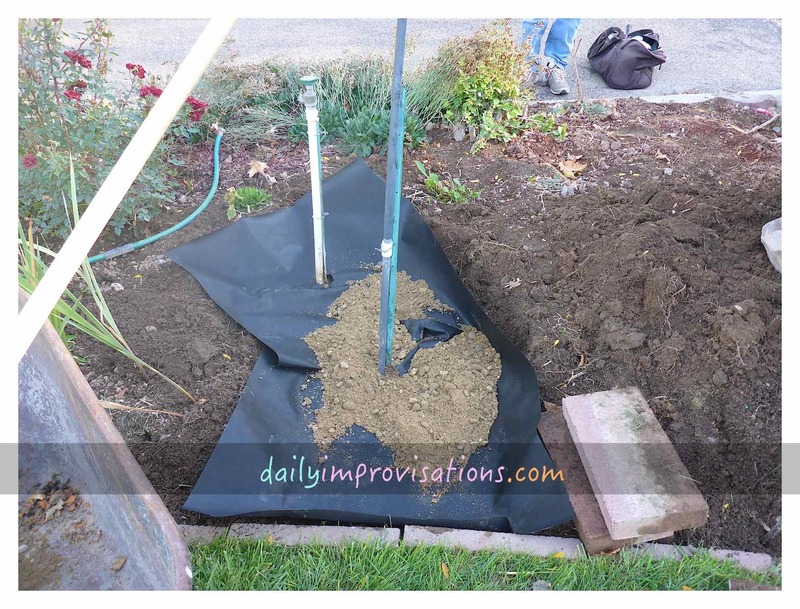 Since men at my house tend to leave piles of sand and gravel around for their various projects, I went and got some to put on top of the weed barrier fabric. I have been told I can use it, don’t worry. 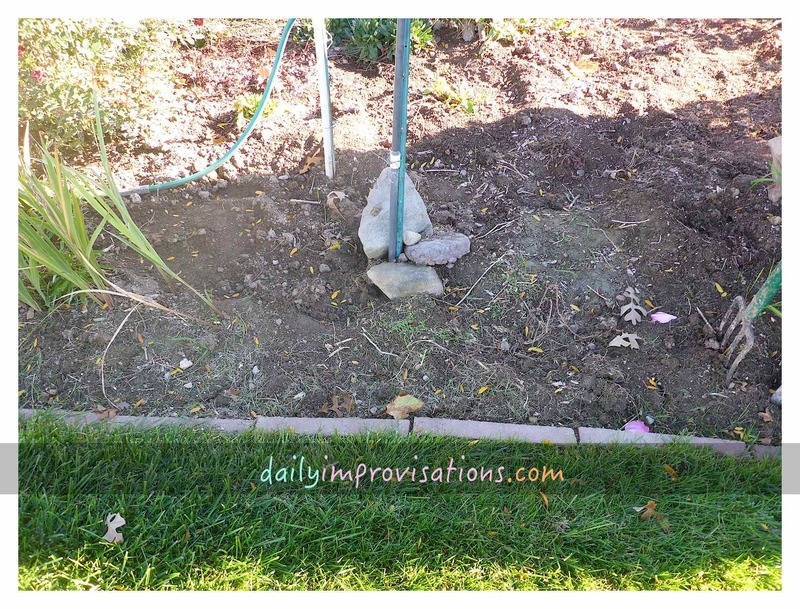 This mix makes it easier to level the pavers and provides an underlay that makes it less likely the pavers will crack with shifting ground. About then I remembered some scalloped edgers that had been laying around for a few years. 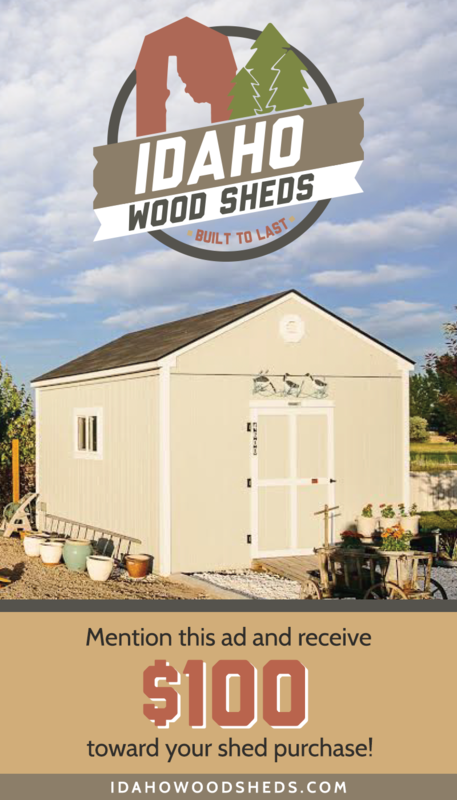 They were the answer to wanting higher edges that would keep at least some dirt and debris from encroaching. In a place like this, where I would not be needing to push a wheelbarrow on the path, higher edges were practical. 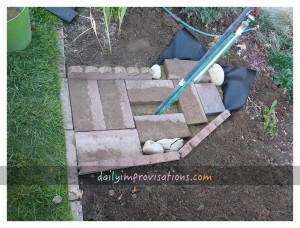 Once an initial layer of the sand and gravel was spread over the weed barrier fabric, I tried to set in a paver. It wasn’t laying quite right, so I was glad that I remembered how I had seen my son add and subtract the sand mix for patio work. A few handfuls of the sand mix in specific places under the paver made it lay level and at the height I wanted. 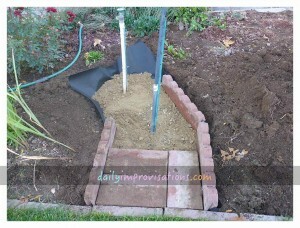 The section closest to the garden border was easy to make straight and tight with pavers and edgers. 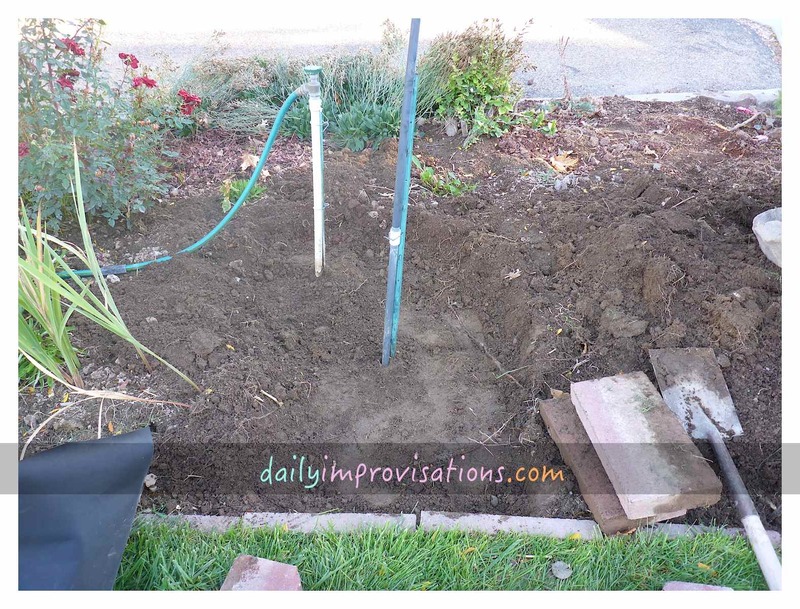 After I had it all fitted the way I wanted, I pulled the weed barrier fabric up against the outer edge of the scalloped border and packed some dirt to hold it in place. If the weed barrier fabric was higher, and thus more visible, than I wanted, I tucked it down some. 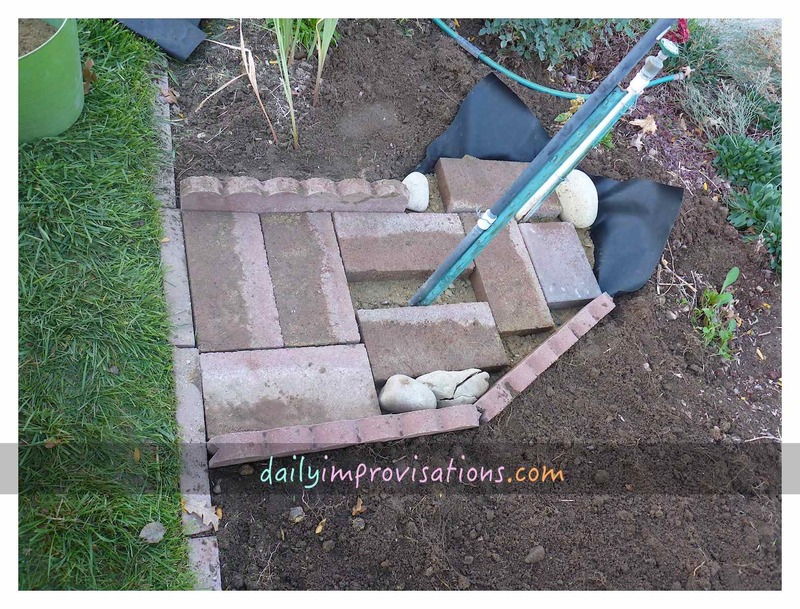 Now, I endeavored to fit as many rectangular pavers around the pipe risers as I could. I got in more than I thought I might at first and was pleased. Inspection of the rock piles showed me that I had two sizes of smooth rocks to choose from. 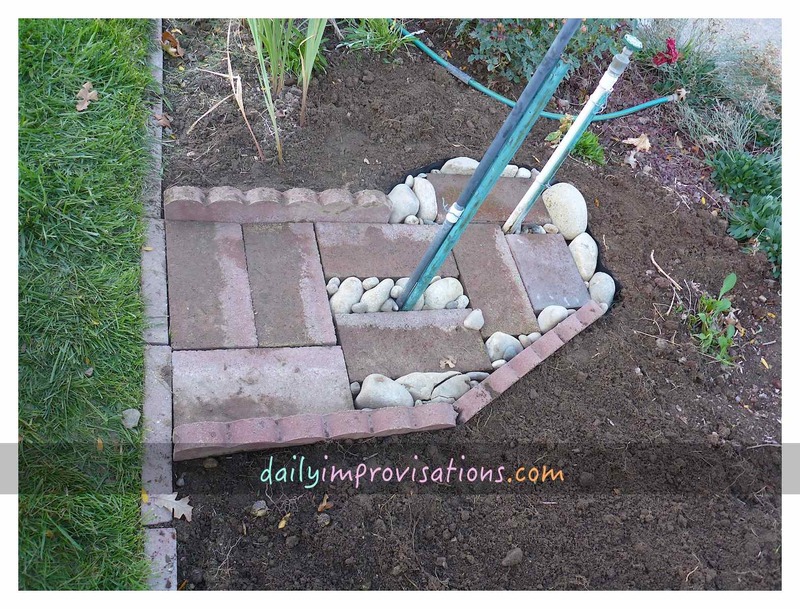 I picked a variety of the larger ones, hoping they could fit well in corners between pavers and help me form a cul-de-sac toward the other end of the project. I didn’t have any other edgers available and didn’t want to work a bunch of small bricks to form a circle, so the larger rocks were going to have to do. And they did. Here I have begun to fill in spaces with larger rocks, like I am working on a puzzle. The smaller rocks filled in the last of the spaces quite nicely. In most places these were in more than one layer to get the desired affect. They also worked to hold the larger rocks in a more exact position. Lastly, I trimmed the edge of the weed barrier fabric around the cul-de-sac, followed by pressing up some dirt against it to sandwich it to the outer border of mostly rocks. I am a little concerned about dirt getting over that edge, and so will be on the look out for something that I can put round it to avoid this. However, for now, I am very pleased with my little project. Importantly, my husband seemed impressed and happy with what I had done. I hadn’t warned him and don’t usually tackle this type of project myself. Phew. From digging to final trimming of weed fabric, it took me 3 hours.